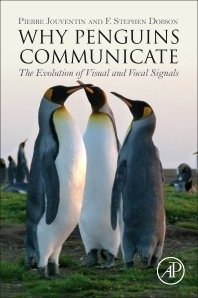 Why Penguins Communicate: The Evolution of Visual and Vocal Signals is a comprehensive and condensed review of several hundred publications on the evolution of penguin behaviors, particularly signaling, linking genetics and ecology via such behavioral adaptations as nuptial displays. This exciting work has developed from the authors’ many years researching on the behavioral strategies of penguins, such as the unique vocal signatures for individual recognition. Studies of penguins on islands surrounding Antarctica are presented, fully showcasing the behavioral significance of visual ornaments (mating displays) and how and why penguins behave via adaptive evolutionary explanations. Through this evolutionary lens, the authors address several questions involving their identification and taxonomy, habitat and location, breeding, and differences between penguins and other seabirds. Each species occupies a unique ecological niche, and behaviors permit separating the species through mutual display. Although model organisms in science are diverse and specialized, we see the entire integration in penguins, from acoustical and optical physics, to behavioral display and speciation. This work highlights the adaptive significance of their behavior through an evolutionary point- of-view. How many penguins and where? Why study the behavior of penguins? Why do penguins have ornaments? Pierre Jouventin is the retired Director of Research, National Center for Scientific Research (CNRS), Montpellier and past Director of CNRS laboratory at Chizé (13 years). He has published more than 230 peer reviewed scientific articles, four books (in French); and has made more than 20 research trips to the Antarctic with nearly a decade of collective experience there. F. Stephen Dobson is Professor in the Department of Biological Sciences at Auburn University, as well as retired Director of Research, National Center for Scientific Research, Montpellier; Chevalier, Order of Academic Palms (France); and a Fulbright Scholar. He has published more than 125 peer-reviewed scientific articles and has made six research trips to the sub-Antarctic for penguin studies.